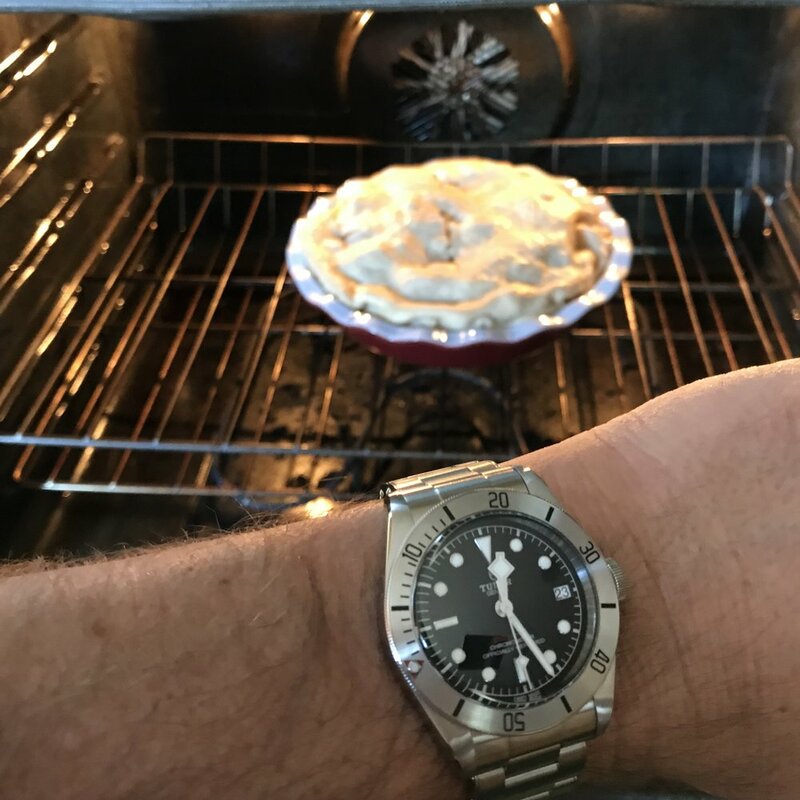 Thanksgiving with the Tudor Heritage Black Bay Steel. A brilliant new contender for Membership in the One Watch Club. I know it's virtually sacrilegious, but I do not aspire to a Rolex. There, I've said it. Although I have nothing against the brand, I've just never felt any compelling need to own one. 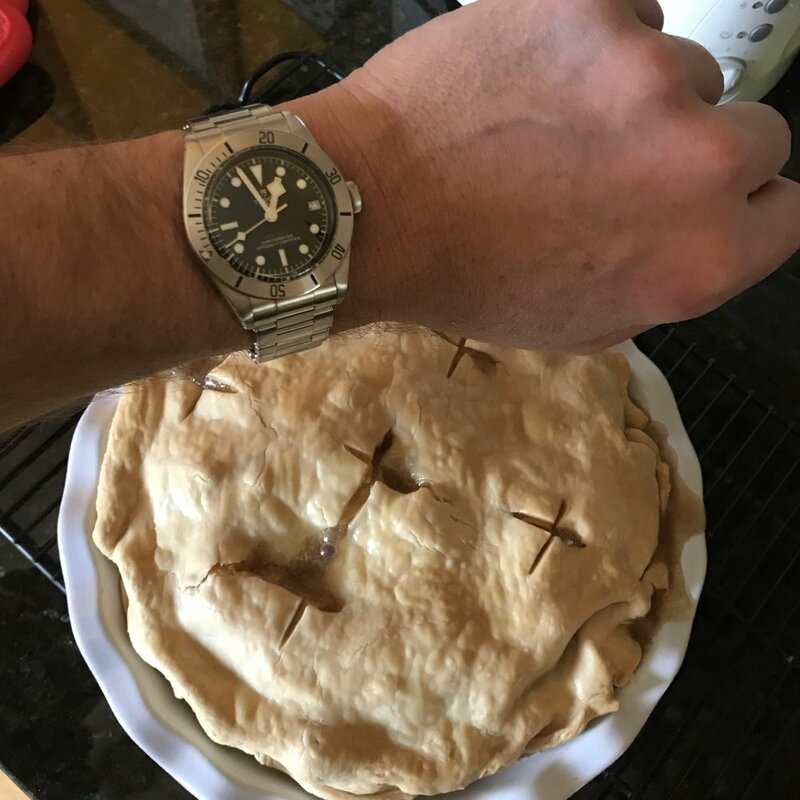 So when Tudor announced its vaunted return to the US with the ETA-powered Black Bay, I remember thinking it was a nice-looking watch with an unexciting movement and an unwarranted price tag. Weren't there numerous micro-brands with the same build quality and movement available for less than one-third what the Tudor cost? 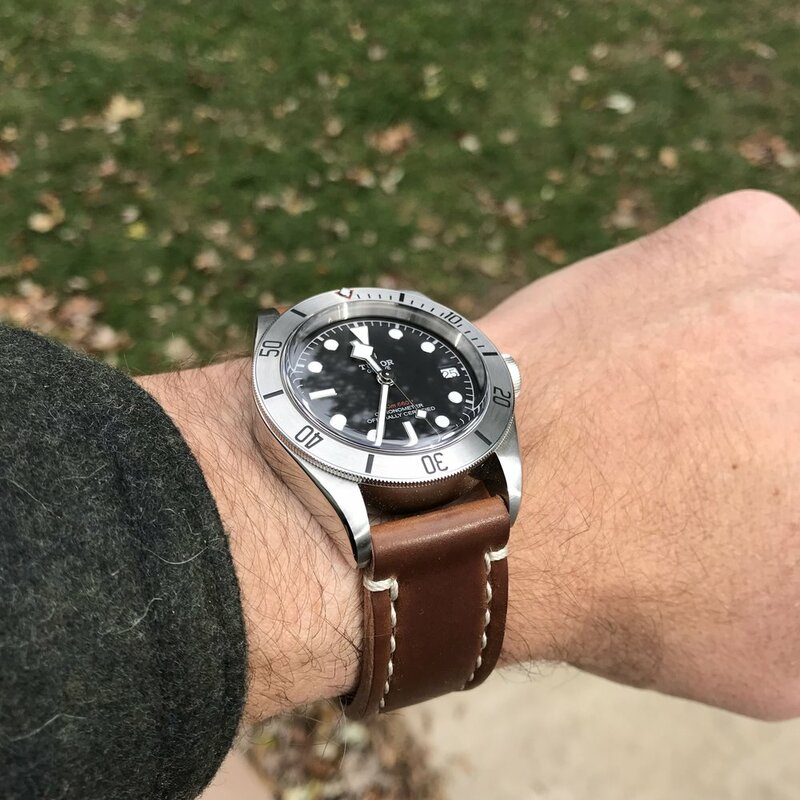 Later, when Tudor announced the North Flag and their new in-house movement beating within it, I was intrigued, but the peculiar case and lug design put me off from trying one. So I didn't really even notice when that movement migrated to the Black Bay. Until, that is, a trusted friend bought one and couldn't find enough good things to say about it. The Black Bay Red, owned by a friend who recommended the watch very highly. The look of the steel-bezeled variety was attractive enough in pictures, but it took seeing one in person to truly appreciate this watch. Walking into the dealer, I still didn't expect to appreciate its price:quality value ratio, but its combination of retro diver design, utilitarian styling, toned-down dial text, boxy sapphire crystal, and offset crown all conspired to overturn my preconceived notions of Rolexiness and I was immediately drawn to the watch. Once the Heritage Black Bay Steel was on my wrist, I had to admit that it "had me at hello." Moreover, after wearing it straight for a couple of weeks, I am ready to nominate this watch for membership in the One Watch Club. At last, a Submariner for me: the Tudor reference 79730. The Tudor Heritage Black Bay Steel, ref 79730. Seen here on the very comfortable bracelet. Reasonable size. For me this is about 40-42 mm, although I'm flexible since one number never tells a watch's whole story. The Tudor is a very comfortable 41 mm in diameter, and it's not too tall at 14.8 mm. In fact, I would say it's perfectly proportioned, and it wears great on the wrist. Good water resistance. A One Watch watch needs to have at least 100 m of water resistance since my life involves a lot of water-based opportunities. The Heritage Black Bay has a rated WR of 200 m.
Strap flexibility. I'm not much of a bracelet guy and I'm not really a rubber strap guy either, so for me a watch has to wear well on nylon straps and leather straps. If a watch isn't strap-friendly, this is a deal killer for consideration as a One Watch watch. Happily, the Black Bay wears very nicely on Rover Haven Arts & Crafts straps and nylon NATO straps. It's also very nicely worn on the stainless steel bracelet, which coming from me is saying a lot. Better than average lume. The ability to read my watch upon waking up in the middle of the night to, say, let an old dog out to pee, is a key characteristic for me. The Black Bay glows like the proverbial torch. Strong legibility. I've had some really cool watches, but I've learned that if a watch isn't easily read at a glance, it just won't last with me. Someday I will write a blog post about watches I loved but which didn't last because they failed this key test. Rotating bezel. A good One Watch watch will have some means of quickly and easily measuring short intervals of time. For me, this is a count-up or count-down bezel, and the Black Bay's dive bezel has a very nice action. Date. A good watch must have a date indicator to be considered for admission into the One Watch Club. I don't really care where it is, as long as it isn't Sore Thumb Ugly. The Black Bay's white date wheel at 3 o'clock blends right in and looks great. Drilled lugs. Since this has become so rare on new watches these days, it's bonus point territory only. 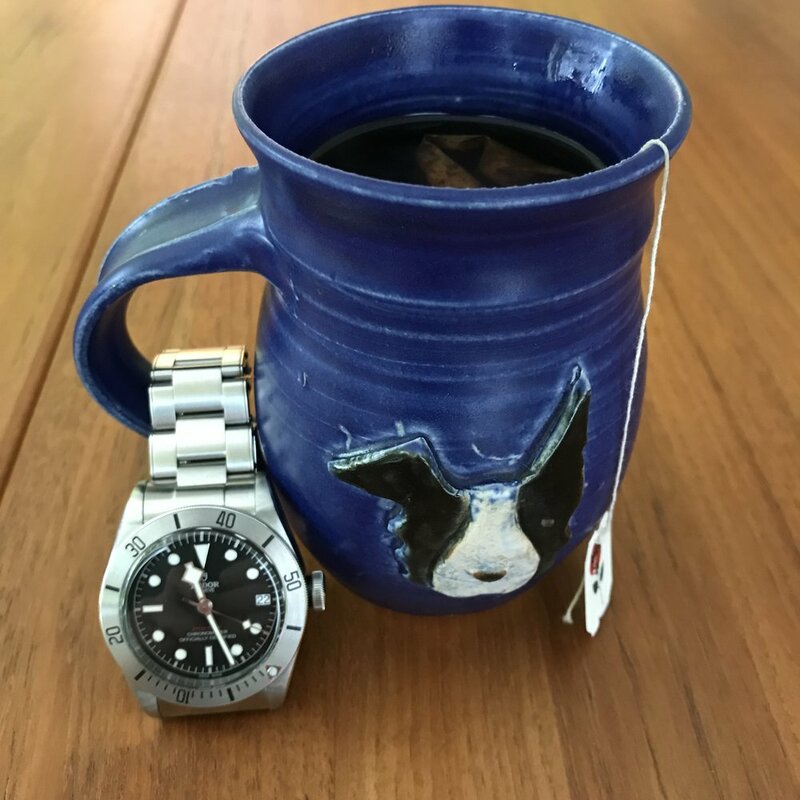 Sure it's a "diver's" watch, but I get the most utility out of my timing bezel using it to time my tea steep. So the Heritage Black Bay Steel scores a near-perfect 7 out of 8 on the Rover Haven One Watch test. But what about all those little unquantifiable things that make the difference between liking a watch and loving a watch? One important characteristic which does not appear on the RHOW criteria is timekeeping. The Tudor is powered by its amazing manufacture caliber MT5612, and if you are a timekeeping nut, the Tudor Heritage Black Bay is sure to please. I'm not really all that hung up on timekeeping, but I do appreciate when a movement does it so well. My own personal annoyance doesn't set in until variation is greater than +/- 10 seconds per day, and even then if a watch is consistent I'm ok with it. It's when a watch becomes unstable, losing time today, gaining a whole minute tomorrow, that I will pull the plug and send it in for service. 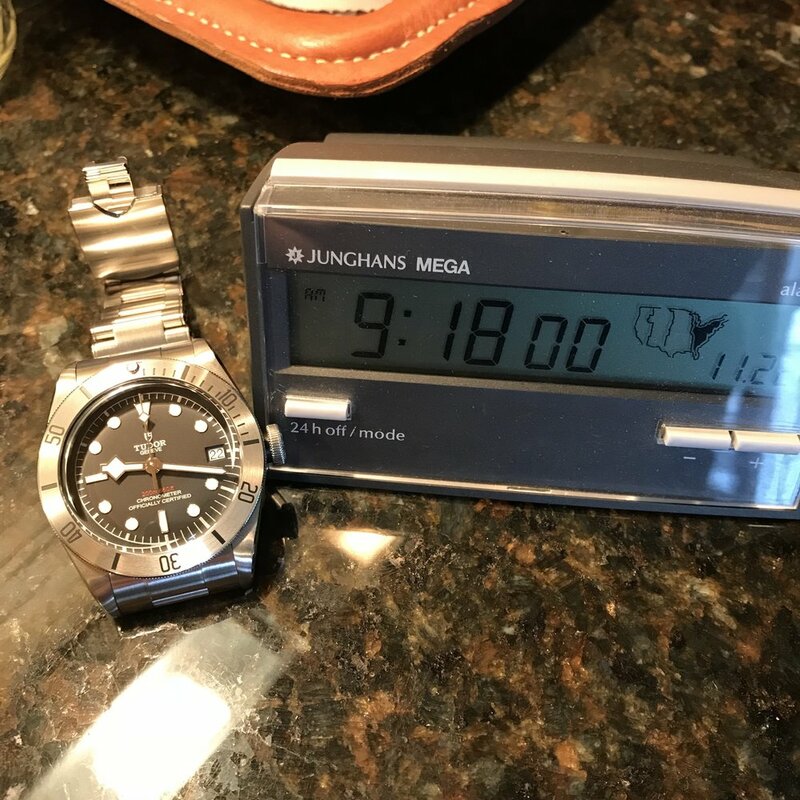 To test timekeeping over this four-and-a-half day review, I hacked the watch with my Junghans Atomic clock on the Wednesday morning before Thanksgiving, and then wore it 24/7 for the holiday weekend without care or worry. I then checked it against the Junghans again on Sunday morning, exactly four days later. Aesthetically, the Heritage Black Bay Steel is a treat. Compared to some other Tudor watches, the dial text has been tamed to a very reasonable three lines of text above 6 o'clock, and one of those is in red, which makes it less immediately noticeable. Up at 12 o'clock, the shield logo has been employed, and is small and discreet. I don't mind the Tudor rose logo, but the shield just seems so right on this dial. The rose decorates the crown, and to really good effect too. Beautiful dial details. I love how the diamond doodad on the seconds hand is a scaled down version of the snowflake hour hand. The beautifully enameled Tudor rose adorns the crown. Note also the very gentle jimping on the bezel edge. If you really dove with this watch, you'd probably want something more aggressive, but the bezel's action is superb. The shield logo at 12 o'clock. On the Wednesday before the Thanksgiving holiday, my teenager and I took a little road trip to the small village of Cannonsburg, Michigan, and had lunch at the Honey Creek Inn. It was an unseasonably beautiful day in Michigan, and the sun was showing itself for the first time in days. We took his Focus ST and enjoyed the drive on the hilly, curvy roads. Of course the Black Bay was my companion for the trip, and it struck me as we were zipping along that the Tudor and the Ford have a lot in common. Both are highly spec'ed, reasonably priced, made to appeal to purists (but not snobs), and perform brilliantly. The white Focus ST picks up every little speck of November road grime! And 5 minutes later we were inside and ordering. The Blue Gill basket is fantastic if you ever get to the Honey Creek Inn! And later that evening as we relaxed around the fire, I was comparing this watch to another Rover Haven favorite, the Hamilton Scuba. The Hamilton has to be the best One Watch value out there, at least as far as Swiss Made watches go, and its 80-hr power reserve bests the Tudor's 70-hr rating. The pleasures of the Thanksgiving holiday include time to read for leisure (background). The brilliant and affordable Hamilton Scuba has an 80-hr power reserve, besting the Tudor's 70-hr rating. Regarding strapability, it's very obvious that the designers of the Tudor Heritage Black Bay had straps in mind. The lugs are long and graceful, and the spring bars are located low and outboard of the case. Like the Hamilton Scuba, the spring bars are located only slightly above the plane of the caseback, which translates to a very NATO-strap-friendly wearing experience. It's difficult to overstate the importance of this subtle design feature. Another watch I otherwise love, the caliber 2500 Planet Ocean, is quite poor in this regard. Its distended belly forces any one-piece pass-thru strap to travel too far up and down as it passes through and under the watch, cradling its pregnant caseback. The result is an uncomfortable fit and a rather silly look; but not so the Tudor. NATO strap fan? You will love the way the Heritage Black Bay wears on nylon NATO straps. A Land Rover and a good wristwatch, two useful tools at work. After the wood has been carted and stacked, we head back in to make our contribution to the extended family feast, the apple pie. Once again, the timing bezel's utility shows why it's on the list of One Watch must-have criteria. Our family has so much to be thankful for, and the evening is a delightful and warm one spent with those who love and support us the most. A true gift. A traditional American Thanksgiving dinner, served with love. And later, the weekend finds us doing some late fall yard cleanup. 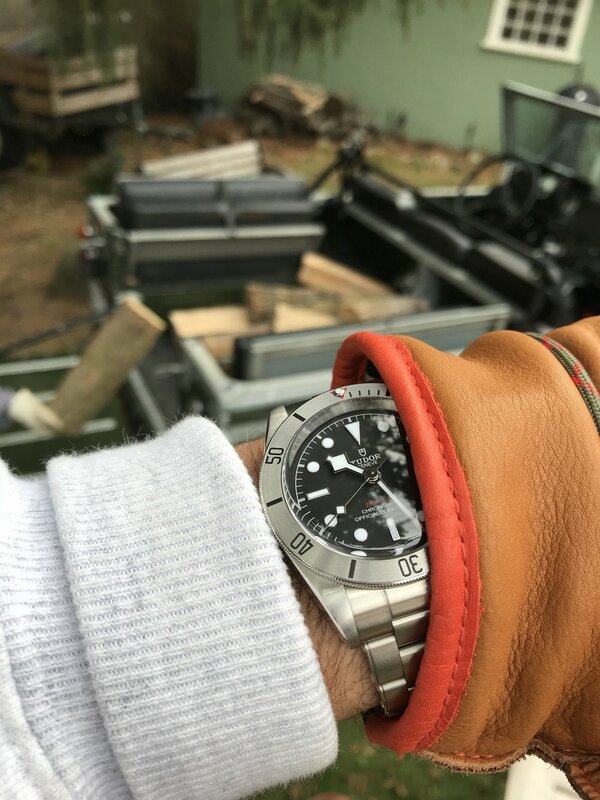 I switched the Tudor over to an Arts & Crafts strap, and I have to admit the comfort and ease of this setup is brilliant. These pictures really make it clear how strap-friendly the case is, with plenty of clearance between the strap bar and the apex of the case. Of course, if you're just not a fan of dive watches on leather straps, then this won't matter to you. The Tudor Heritage Black Bay Steel on a Bourbon Arts & Crafts. Just right. And so the long holiday weekend winds down, and tomorrow it's back to work and school. Just one more thing to take care of, and that's the results of our timekeeping test. Over the course of four days, the Tudor lost 10 seconds, for an average rate of right around -2.5 seconds per day. If I cared more, I could probably experiment with positioning it at night to catch this back up while I slept. But given the watch's overall charm, I find this quite acceptable. Thanks for reading my blog. 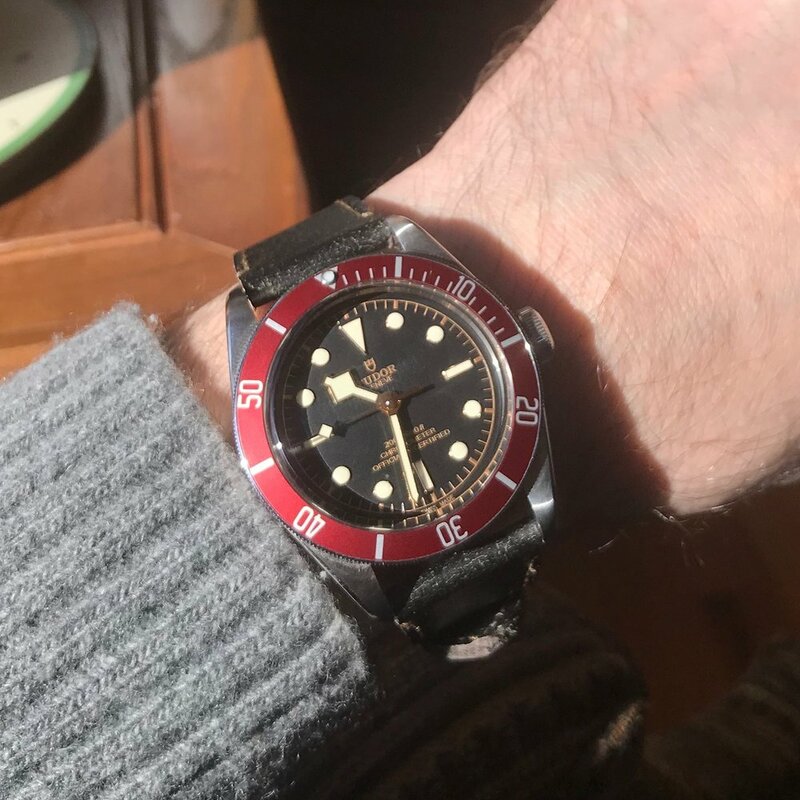 If you have a Tudor Black Bay and would like to share your story, I welcome hearing from you.